Promising clinical trial results published on 44 patients with small lung nodules that were previously considered hard to reach with conventional tools. Veran is a privately held medical device company headquartered in St. Louis, MO. The company’s main focus is assisting physicians in the early diagnosis and treatment of lung cancer. In the United States, lung cancer kills more people each year than breast, prostate, and colon cancers combined. Veran has developed and commercialized an FDA cleared, next generation electromagnetic thoracic navigation platform called the SPiN Thoracic Navigation System. Veran’s breakthrough technology has been adopted by leading cancer centers throughout the United States. Veran provides physicians with a full line of bronchoscopic brushes, needles, forceps and steerable catheters with tiny electromagnetic sensors embedded in the tips for precise navigation. The combination of these proprietary Always-On Tip Tracked® instruments and Veran’s exclusive patient respiratory gating technology enables physicians to accurately access lung nodules by accounting for nodule movement during patient breathing, a common challenge for lung specialists. Another challenge lung specialists face is that approximately 40% of lung nodules lie outside of an airway, making them very difficult to reach endobronchially, and traditionally requiring an additional procedure. 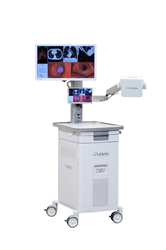 Veran’s SPiN Thoracic Navigation System is the first and only FDA cleared technology that enables Pulmonologists or Thoracic Surgeons to safely and accurately access lung nodules outside of an airway using SPiNPerc, a navigated transthoracic needle. With SPiNPerc, Veran combines endobronchial navigation with percutaneous navigation, allowing physicians to access all lung nodules in a single procedure, regardless of nodule size or location. This eliminates the cost and risk of unnecessary procedures and empowers physicians to provide a same day diagnosis for their patients. The early diagnosis and treatment of lung cancer has been proven to save lives.